SECORE International, the California Academy of Sciences and The Nature Conservancy join forces to implement larger-scale coral restoration. With the Global Coral Restoration Project, SECORE International, the California Academy of Sciences and The Nature Conservancy seal their commitment to help rehabilitate coral reefs and preserve them for future generations. This project aims to study and apply coral restoration techniques and practices on a larger scale, integrating coordinated conservation, education and outreach efforts. By "seeding" reefs with sexually reproduced coral offspring, this project aims to help maintain corals' genetic diversity which in turn maximizes their ability to adapt to future conditions. Furthermore, working with sexual coral restoration has the great potential to produce huge numbers of coral offspring from one coral spawning event. The project includes training for partners from island nations and territories, including organizations capable of translating their efforts into local management plans that support this large-scale coral restoration initiative. The Global Coral Restoration Project starts in the Caribbean and is planned to expand into the Pacific region after its initial phase. "Alarmed by the catastrophic state of their coral reefs, people have made various attempts to restore coral cover with restoration measures," says Dr. Dirk Petersen, Executive Director and Founder of SECORE. "However, outcomes have often been short-lived and lacked an integrated concept. Moreover, the true capabilities of coral restoration have not been exhausted yet. With our joint Global Coral Restoration Project we aim at changing that." Coral reefs are hotspots of diversity that host countless plants and animals. They are a source of livelihood for millions of people and function as essential coastal protection against the frequent tropical storms. Today, coral reefs are on the decline worldwide and doomsday scenarios of their fate have been spreading broadly in the media. In the Caribbean, coral reefs have been seriously degrading over the last three decades, with hurricanes, disease outbreaks and mass die-offs taking their toll. Key reef-building species, such as the elkhorn and staghorn corals, are critically endangered?one focus of this collaborative project is to assist in the rehabilitation of those species. The first phase of the Global Coral Restoration Project will focus on the Caribbean. Scientists of the three key-partner organizations have gathered profound knowledge about coral reproduction and how to restore and conserve corals of the Caribbean, and plan to use a wide array of tools to implement coral restoration on largerscales. "The Nature Conservancy has been working throughout the Caribbean for over 40 years, helping to establish millions of acres of marine protected areas and learning from multiple coral restoration efforts including our own," says Dr. Luis Solorzano, Executive Director Caribbean Division, The Nature Conservancy. "Through this collaboration with SECORE and the California Academy of Sciences, we will accelerate the science and innovation required for scaling up coral restoration efforts. 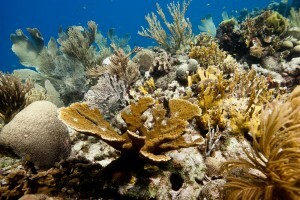 Our efforts can help to ensure healthy and resilient Caribbean reefs." Within the frame of the Global Coral Restoration Project, hands-on practices will be shared with local stakeholders, in turn enabling a more comprehensive approach to assist in the rehabilitation and active restoration of coral reefs. During the past few years, the project partners have studied how to raise large numbers of delicate coral larvae of several Caribbean species, practiced less labor-intensive ways of seeding coral recruits on reefs, developed protocols to choose suitable restoration sites and learned how to efficiently monitor ongoing restoration success. Over the last decade, SECORE and partners have pioneered the study of sexual coral restoration applications, a relatively young research discipline. Taking advantage of the corals' sexual reproduction has the potential of producing huge numbers of genetically unique coral recruits--millions, if done correctly. Those coral recruits could be raised from one spawning event: coral gametes are collected in the wild or at the laboratory and fertilized in vitro. The resulting larvae are cared for and provided with settlement substrates when they are ready to metamorphose into a coral polyp. SECORE is currently developing and testing techniques to raise and handle large amounts of coral offspring. The time and manpower required to handle coral offspring and plant them onto wild reefs often limit restoration efforts. Accordingly, SECORE and partners have designed coral settlement substrates that self-attach to the reefs, enabling seeding coral recruits to join the reef in meaningful numbers. SECORE and partners are currently conducting pilot projects for larger-scale sexual coral restoration on Curaçao and in Mexico. Through this partnership, three capacity-building centers will be established in the Caribbean: in Mexico, Curacao, and the U.S. Virgin Islands. At each location, a local team of experts will test and refine sexual reproduction techniques, and share these through capacity-building trainings and workshops with coral reef practitioners around the world. In addition, local communities will be actively involved in the process, providing local partners with outreach tools to facilitate community engagement. Integrating the communities that are impacted by this work is critical to making any restoration and conservation efforts successful in the long-term. "Our capacity building centers will foster research and technology development, exchange of knowledge and expertise, and provide training courses and outreach", says Dirk Petersen. "We will host annual training workshops for Caribbean stakeholders. The centers will function as bases to expand our network and to guide local restoration practitioners who have been fighting the decline of their reefs on their own. By joining forces and coordinating efforts in many places around the Caribbean, we can make a real change for the survival of coral reefs." The first task of the new alliance will be the kick-off workshop entitled "New techniques for coral restoration in the Caribbean" on Curaçao this May. Representatives of stakeholders throughout the Caribbean and scientists from various disciplines will meet to learn hands-on practices--including collecting and fertilizing coral gametes and practicing the handling of larvae to be seeded onto degraded reefs--and share theoretical background knowledge. Each workshop will build on the last, incorporating lessons learned and refining the techniques that enable lasting, larger-scale coral restoration.